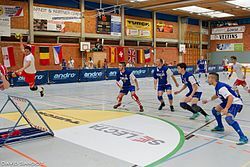 Tchoukball was created in Switzerland by Hermann Brandt, who was concerned by the numerous serious injuries among athletes resulting from sports prone to aggression and physical contact. He believed that sports should not only for champions, but also contribute to the creation of a better and more humane society. He designed tchoukball to contain elements of handball (it is played with hands, and the balls used are similar), volleyball (as the defending team must prevent the ball from falling) and squash (since there is a rebound). The FITB, founded in 1971, is based in Geneva. It now comprises 43 member associations and 16 countries with a designated FITB Representative. It supports and advises national associations and individuals willing to implant tchoukball in new areas. For instance, tchoukball was recently integrated in the school program of some regions of Senegal. The FITB was a demonstration sport in the 2009 World Games, which took place in Kaohsiung (Taiwan).